As promised, here is one of the desserts Chris and I tackled while she was visiting this past weekend, a Cassata Cake, as part of another Bakenista get together. 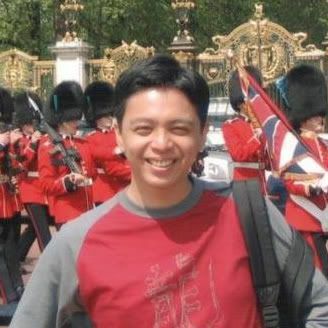 I have to admit that I would have probably passed on this Bakenista shing-ding if Chris had not been in my kitchen. Not much time left for "fun baking-just because" these days and not much room left in the fridge for a big cake like this. We had not really planned to bake that early together again but it looks like the folks at King Arthur got word of our little Skype chats and got interested to check out how we were baking live while spread across the US. Halley, from the King Arthur Test Kitchens blended right in and seemed to enjoy the experience, and it seems that we were all trying to be on our best behaviour!! From my end, the experience was even better since I had another Bakenista in the kitchen and Italian to boot...how fitting when making an Italian classic, isn't it?! I hope that Chris posts her step by step pictures of the cake making while I post the finished product. We started around 9am, a littler earlier than our scheduled Skype chat, but we were aligning ourselves on "puppy time" and Bailey was falling back asleep then. It was a wonderful morning of tag teaming making the cake and working the keyboard to chat with the others. I started with the cake batter, I think... not that I am getting old or anything but between lack of sleep, puppies, and a rum soaking syrup at 10 am, I somehow found myself scratching my head at 4pm that I was still in my jammies! Chris prepared the ricotta, pistachio, and chocolate filling and layered the cake with it while I was trying to pull Bailey away from Tippy's tail. When we looked at the clock, it was already noon...Wow...time does fly when you are having fun!! While Chris was here, she asked me to give her a couple of lessons on basic pastry methods, like making macarons (her firsts and a success! ), cream puffs (not her first but a little recap), dry sugar caramel (her fear), etc...Showing her the different consistency of things as we went along was a lot of fun. In spite of the humidity I made some caramel corkscrews to decorate the cake and to show her the right consistency to play easily with caramel and they lasted about the time of the photo shoot it was so humid. Later in the afternoon, I covered the cake with a stabilized whipped cream frosting and decorated it wishing she were still around to share a slice with us, not to mention that she was a fantastic and very patient photo assistant all weekend and somehow taking pictures of the cake without her felt kind of empty. Stay tuned for other installment of our baking fest! 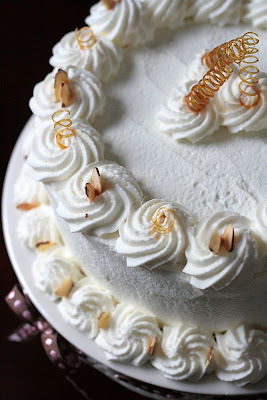 The recipe for this Cassata Alian Sicilian comes from Dolce Italiano by Gina De Palma and originally includes orange zest and almond extract which we skipped as the filling was flavorful as is, spread on rum soaked cake trimmings so we figured it might be overkill. The icing called for is a basic powdered sugar icing but somehow that seemed super sweet to us so we decided to go for a simple whipped cream frosting stabilized with some gelatin...crucial in high humidity settings if you do not serve the cake right away so you avoid the risk of ending with a pool of water on your cake plate. It seems like a really long recipe but it is very detailed...granted it is not a cake you start at 5pm for dinner at 8pm, but it is extremely complicated and comes together quickly. Preheat the oven to 350°F and position a rack in the center. Lightly grease two 9-by-2-inch round cake pans with butter or nonstick cooking spray, line them with parchment paper, then grease the parchment. Sift together the cake flour, baking powder, and 1 teaspoon salt into a medium bowl and set aside. In the bowl of an electric mixer fitted with the whisk attachment, beat the egg yolks and sugar on medium speed until very light and pale yellow in color and doubled in volume. Beat in the vanilla extract, followed by the melted butter. Transfer the egg mixture to a large, clean mixing bowl. Fold in the dry ingredient-quickly and lightly, stopping just before they are fully incorporated. Clean the whisk attachment and mixing bowl. Place the egg whites and the pinch of salt in the cleaned bowl of the electric mixer. Using the whisk attachment on medium-high speed, beat the egg whites until firm peaks form. Fold the egg whites into the batter quickly and lightly, incorporate any streaks of dry ingredients that remain. Evenly divide the batter between the prepared pans, rap the pans against the counter top to eliminate air bubbles. Bake for 35 to 40 minutes, or until they are golden brown, a cake tester inserted in the center comes out clean, and the cakes have begun to pull away from the sides of the pan. Allow the cakes to cool for 5 minutes in the pan, then carefully unmold and set them out to cool on a a wire rack. While the cakes are cooling, prepare the rum syrup: In a medium saucepan, stir together the sugar, water, and rum. Place the saucepan over medium heat and bring the contents to a boil. Lower the heat and allow the syrup to simmer for 5 minutes. Remove from the heat and let it cool. Filling: using a microplane or box grater, grate the chocolate into fine, feathery shreds. Using a sharp knife, finely chop the pistachios. Place the ricotta, confectioners' sugar, and cinnamon in the bowl of an electric mixer and, using the paddle attachment, beat until the ricotta is creamy and soft (it will remain slightly gritty due to its original consistency). 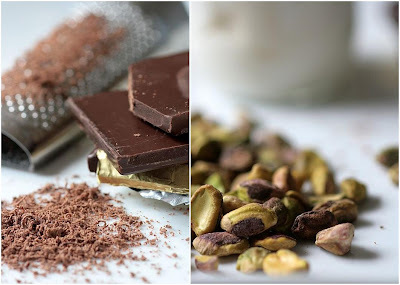 Add the grated chocolate, chopped pistachios, and beat just until combined. Assembling the cake: Have ready a 9-inch springform pan. 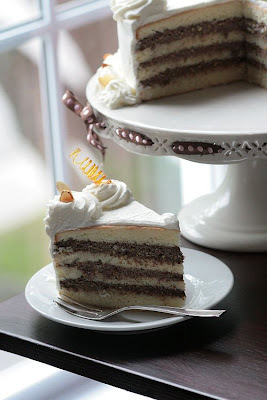 Using a serrated knife, carefully split each cake layer in half horizontally to make four layers. Place one of the layers in the bottom of the pan and, using a pastry brush, moisten it generously and evenly with some of the rum syrup. Spread the cake layer evenly with one third of the ricotta mixture. Repeat twice with another cake layer, more of the rum syrup, and another third of the ricotta mixture. Place the final cake layer on top and generously brush with the rum syrup. Wrap the springform pan tightly in plastic wrap; this helps the layers fit snugly on top of each other. Chill the cake in the refrigerator for at least 4 hours or overnight. In the bowl of a stand mixer fitted with the whisk attachment, whip the cream with the sugar until soft peaks. In the meantime, dissolve the gelatin in the microwave for 10 seconds. Mine broke so I set the cup where the gelatin was in a large saucepan filled with a couple of inches of water, brought the water to a simmer and waited for the gelatin to melt. Slowly pour the gelatin in one steady stream over the whipped cream and continue to whip until firm. If you add your gelatin a little cooled and before the whipped cream is still at soft peaks stage, it should not clump on you. Decorate your cake with the whipped cream and return the cake to the refrigerator to chill until you are ready to serve it, at least 3 hours. So, who else is left with a huge hunka chunka of Cassata? Well, that would be Lisa, John, Ivonne, Stephanie, Ben, Kelly, Marcela. Chris can only look at her work and my hips are not too happy about that! It can easily serves 12, needless to say that after we kept a couple of slices for a little afternoon break, I took the rest to the neighbors! It is a special occasion cake but having Chris around was special enough to make me turn the oven on in the morning on a very hot day! Words about friendship, even ones formed over the internet never rang truer learning about the sudden passing of one Daring Bakers, Sher from What Did You Eat? I can't say I "knew" her but I was a fervent reader and loved her recipes and wit. You will be missed Sher and always remembered. I loooooove layered cake. And for it to be filled with chocolate? Awesome. I have to admit, though, when I saw the title I had it confused with a castella-- a Japanese-style spongecake. What a stunning presentation. That cake is too beautiful to eat! What an amazing cake! I'd never come across stablized whipped cream frosting before, so thank-you for that, Tartlette! That is so pretty. It must have been fun to be baking with Chris. Wow! Stunning! And it sounds so damn delicious! What a pretty cake! It sounds daunting, but a lot of fun. Now THAT is a cake...absolutely gorgeous!!!! 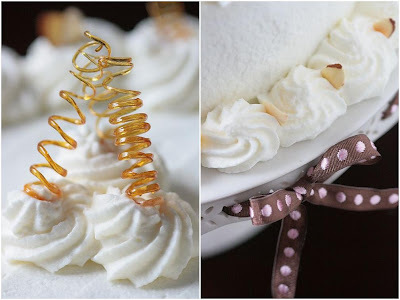 The cake looks stunning, but those little caramel corkscrews get me every time! I'd love a master class in the spun sugar. oooh..the pics make me wish I was still there! It was so fun tag team baking. :) That slice looks peeerfect! heeee! I will be putting your lessons in action this weekend...will let you know if I can repeat performances. Off to complete my post with some of the steps...! Always up for a cake and sounds like it was a fun play day for you. what a great cake you guys made. that must have been so much fun! It's such great fun to have the perfect company in the kitchen whilst baking! The cassata looks awesome - way beyond my decorating skills! I love the caramel corkscrews. You two are great together!! I am overwhelmed at how wonderful that looks!!! What a beaut! I especially love the corkscrews (and hope you will one day teach me to make them.) And you answered my question about cream and gelatin before I could even ask it. Btw, I tagged you for an award, but not the meme cause you are too busy!, over on my blog. Come and get it! Looks wonderful, and I really like the stabilized whipped cream frosting. I'm not a big fan of buttercream, but whipped cream is another story! That is stunning! I am in love with those caramel corkscrews. That is one gorgeous cake! I always love those caramel corkscrews! Oh wow, I mean wow. That cake, those corkscrews...it just exudes and drips class...I'm in love. Okay those are the only ones I know right now. You guys must have so much fun. I am envious. And how cool to bake in person with another Bakenista! I love the caramel corkscrews, love, love, love them! What a beautiful cake, special occasion indeed! Cassata cake is my absolute favorite cake, EVER. I've never tried making it myself, though, so I look forward to trying out this recipe. It looks so fantastic! I just want to dig right in! Love the spirals on top and the overall presentation. You're an artist! Your decorating talents constantly blow me away. I have little patience for the frosting and decor, but your finished works always inspire me! this could not be more gorgeous..a perfect and dare i say it, absolutely poetic cake. I ADORE Cassata cake!!! Such a classic. Bravo to you and Chris for creating such a beautiful dessert (not that I'm surprised that you'd do so, haha). Beautiful! I love the caramel corkscrews. Such beauty! In everything you make. I cannot imagine the time you spend. omg - what a gorgeous cake! I can't keep up with you - how do you fit it all in? But I'm glad you do - this is inspiring!!! Hmmmm...a 10 am rum soaking in your jammies, Helen? In front of your new baby puppy? Dang woman. But that cake. Ohhhhhh....that cake. Some day, I'll take my time with the finishing details. Gorgeous Cassata! It must be so much fun to bake live on skype! And even better to do it with a live friend next to you! It sounds like you had a great time and the cassata turned out beautiful. Gotta love the caramel curls! Milenko: You made that quick! As you can read, this recipe is not mine and the author might appreciate your feedback. Some reported that the cake was dense but Chris and I found very spongy and light. We did not skimp on the beating of the egg yolk for volume. you know you might have the reason, i thought maybe quantity of melted/than cooled butter, not sure why but i think it would work equally good with genoise or chiffon layers. Simply beautiful. I would have used the zest but that's just me, I am sure it was delicious. Beatiful presentation as usual, Helene! And I love that you and Chris got to spend a great weekend together :) Now we want more Bailey pictures! Her booked looked like a good one! This recipe looks great! Absolutely wonderful cake, Helen! As always. Oh wow! So much effort and frm the looks of it- it's all worth it! What an absolutely beautiful cake! And I love the combination of ingredients. It is stunning. A work of art. Sounds like an amazing weekend. A bientot. What a beautiful cake! I love the look of the frosting - do you think it would hold up piped on to cupcakes? O does it lose shape if its not kept in the frig? The little corkscrews are the perfect compliment too. Is there ever enough rum to soak in a cake? So fun that you and Chris got to bake together. I would love it if you could do some sort of cake decorating tutorial with things like how to make those beautiful corkscrews. Just gorgeous. It reminds me of the bakeries I went to as a girl and the cakes my Nonna would buy for special occasions. Who knew it wasn't ok to give a child a cake loaded with rum! They were yummy, but never looked as beautiful as yours. It's just so pretty and I am so jealous of Chris getting to spend time with my less evil twin! Not to downplay that cake (as it is incredible!) but those little corkscrews look simply amazing. than eternity never touch her. That is a real piece of cake, c'est le cas de le dire. Quel travail ! Tartelette- Congrats on the book! I'll be lining up to buy it and hopefully you'll make the rounds on a book tour??? I just gave you a Premio award from my blog. I know you are super busy, but just wanted to to know it. I made the cake last night, thats how excited I was! A little piece was left behind in the pan so I was able to taste a little bit. I thought it light and spongy too. I put in the freezer. Hope it freezes well. I will be puttingit together this weekend. I cant wait. You are such an inspiration! A friend of mine gave me the recipe for Cassata Ciciliana just recently, and I've been intending to make it sometime soon. Yours looks absolutely amazing and encouraged me to hurry up already:) So beautiful! Encore une fois, une merveille! Et puis, il y en a du boulot! 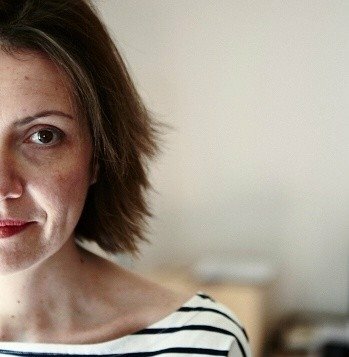 I was looking for a cassata recipe and found your blog! This was the best recipe I found and what a fantastic blog. I've made the recipe 4 times since Thanksgiving! I'm from NY living in TX and missing my cassata cakes. You can't buy them at any bakeries down here. Thank you! JMM: No, thank you! You made my day! Fantastic presentation :) I love the flavor of this cake aside from being gorgeous. Thanks for sharing the recipe. I made this recipe for #Thanksgiving 2015 it was a huge success! I used 2 Tablespoons of Patron Orange Liqueur and water in place of the rum ♥ Thanks for this!